In A Thin Bright Line, Lucy Jane Bledsoe has produced just such a column. Unlike the ancient arctic ice core Bledsoe’s near-namesake protagonist speaks of in this quote, Bledsoe’s column is constructed of words meant to delve into America’s troubling past when it comes to acceptance of her gay and lesbian citizens. Lucybelle Bledsoe is a fantastically intelligent and accomplished writer and editor. After her father refused to pay for law school, she studied and passed the Arkansas state bar on her own, excelled at Columbia grad school, and then quietly took an editorial post at the U.S. Geological Survey in hopes that she would be allowed to live life on her own terms. At the height of the Cold War and following the implosion of a long-term relationship, Lucy takes a job aiding a top secret mission to build an underground arctic city. The catch: She has to claim to be a war widow and vow that she will not pursue a personal sexual life or relationship as long as she works for the government. A Thin Bright Line follows Lucy for the next decade, tracing her struggle to reconcile her scientific and literary ambitions with the all-too-human drive to connect with another person. Lucy’s choices are often illustrated by her settings, but Bledsoe’s angle is more often than not subtle. Bledsoe gives hints of Lucy’s increasing feelings of entrapment by the multiple small rooms she visits and inhabits, widening into broad vistas and outdoor scenes as Lucybelle becomes more open and accepting of herself. Bledsoe draws on the life and experiences of her deceased aunt, the real Lucybelle Bledsoe, in the writing of this novel, but it cannot be described as anything but fiction. Life as a lesbian in 1950s/1960s America was difficult; the quieter one was able to become, the closer one could come to living a “normal” life with a partner. As a result, Bledsoe had little to go on insofar as personal stories about her aunt, aside from many testimonials about how private she was. The novel is a rich amalgam of bits of fact (only Lucy and her immediate boss, Henri Bader, carry names of actual people) and wide swaths of educated conjecture and social commentary about LGBT life of the era. Lucy is tough and resilient, even in the face of sexism and homophobia, even when those things come from within her own community and from friends and lovers about whom she cares deeply. Fortunately, Bledsoe is too good a writer to let her story become subsumed in sexual and cultural politics. This novel isn’t limited in interest to lesbians or women: It also tells the story of a fascinating time in science and international politics. The fact that the ice core Bader and his team extracted in 1966 is still being studied in 2016 is in itself stunning. The characters in this story are never one note. Bledsoe has given them full lives aside from their sexuality—none are there to make a grand pronouncement about one facet of LGBT life, never to be heard from again. At the same time, the story is unstinting in its depiction of the difficulty of living an authentic life as an LGBT American. Bledsoe’s characters are neither angels nor devils. They are human, with multiple forces that drive their behavior. Of special interest is Bledsoe’s examination of lesbian fiction in the 50s/60s. She notes that it required either madness, death at the end, or a complete change of heart and lifestyle. In today’s fiction that involves lesbian characters, a similar sensibility is so common as to be considered a trope. In light of that, it would be interesting to know if Bledsoe considers her ending ironic or realistic. “A thin bright line formed on the water’s horizon, a crack to something brilliant and lovely,” Lucybelle tells the reader, and it’s a hopeful moment. 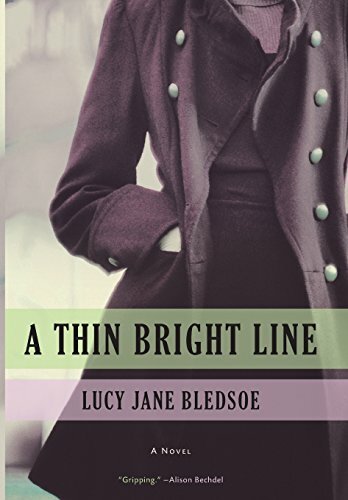 Perhaps in writing a story about a woman who is intelligent, strong, and funny, and who just happens to be a lesbian, Lucy Jane Bledsoe’s A Thin Bright Line will help widen the metaphorical crack in the chains that bind those who are outside of societal norms. Maybe it will help create new norms. At any rate, it would be a mistake to dismiss this book as “only” LGBT fiction. It’s a powerful examination of a life lived on it’s own terms, finally. Despite the ultimate ending, it’s a joyful cry of, “I am! I exist! I persevere!” in a world that all too often goes negative by default. In looking at our shared past, Bledsoe gives a glimpse into a possible hopeful future.